Channel glass first made waves in the design community for its ability to capture and transfer large amounts of diffuse daylight deep into interior spaces without glare or excessive shadows. Today, linear, U-shaped, translucent cast-glass channels are making headlines for their ability to create an esthetic not possible with conventional windows or glass block. Ontario’s Bradford West Gwillimbury Leisure Centre, designed by Salter Pilon Architecture, is one good example (Figure 1). 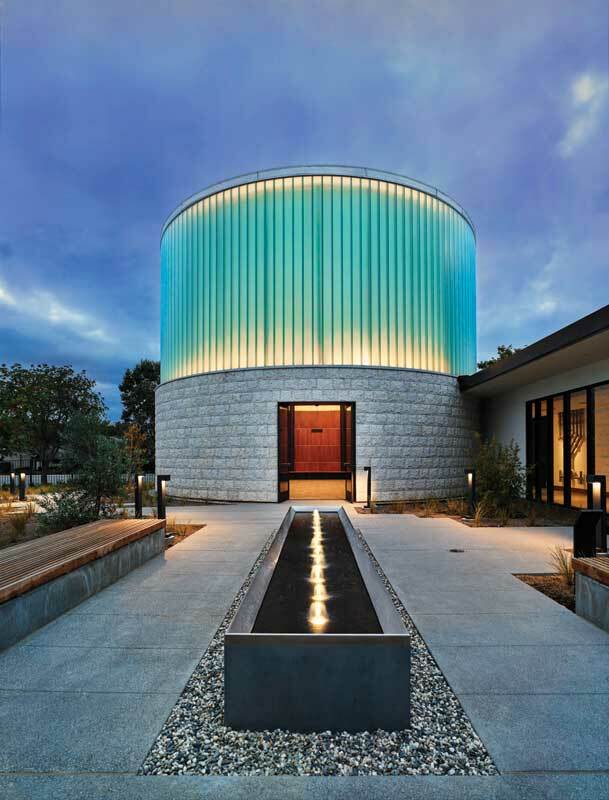 The slender, linear glazed segments wrap around the multi-use recreation facility’s east exterior wall, creating an artfully curving channel glass façade. The façade is formed of a mixture of standard cast glass and clear channel glass. The former diffuses light through its textured surface while also obscuring vision, and the latter adds a second layer of visual interest and provides occupants with access to daylight and views to nature. These varied channel glass segments are set in a serpentine configuration, which break up the building’s rectangular shape and serve as a surround for a lobby, meeting room, and multi-purpose room. By day, the façade transmits light into the leisure centre’s interior rooms. By night, its backlit form helps draw people inside. As design professionals continue to push the form and function of channel glass in projects like the one in Bradford West Gwillimbury, proper specification and use has never been more important. Due to the material’s distinctive nature, building teams may not be aware of how it differs from more traditional glazing materials. This can lead to missteps during the design and specification process that jeopardize its visual appeal and performance capabilities. As a result, it is critical to understand and avoid the following potential pitfalls when using channel glass. Architects must consider a number of building codes when designing façades, partitions, and glazed areas with channel glass. The application may need to meet stringent energy efficiency and daylighting standards while withstanding potentially high wind loads and rain exposure. Another assembly may have specific acoustic, light transfer, and privacy requirements. Figure 1: A channel glass system wraps around a multi-use recreation facility’s east exterior wall, creating a dynamic façade. When evaluating codes, one challenge is the fact safety requirements, deflection limitations of the building structure, acoustic standards, and insulating requirements differ depending on the building height, the occupancy group, and a given channel glass system’s location in a building. To further complicate the matter, best practices and code requirements vary nationally, regionally, and sometimes even locally. 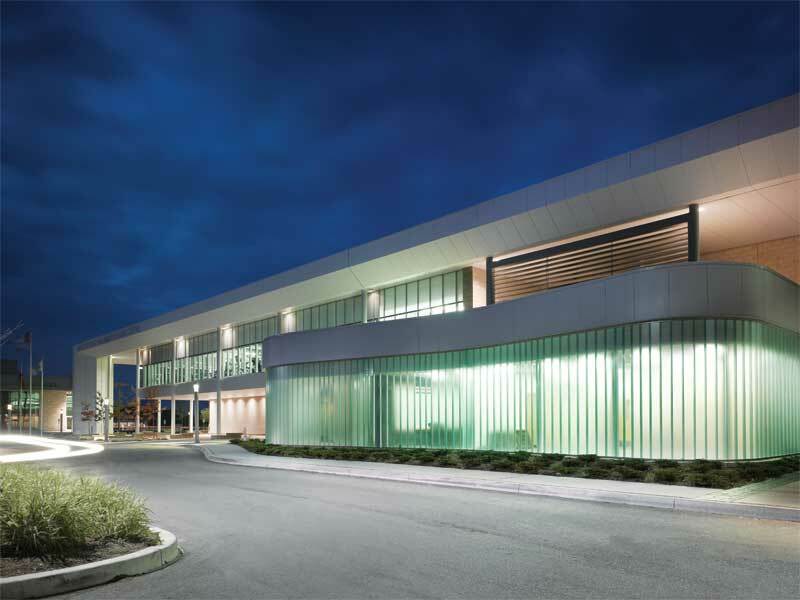 Channel glass in the building envelope of a library located in one of Canada’s coastal regions may have vastly different requirements than one in a landlocked region. As such, whether a building team is familiar with the material or new to it, checking local codes and verifying the specified product has been tested to the appropriate standards—for factors ranging from seismic and wind-induced inter-storey drift to forced-entry and impact-safety resistance—is critical. While it is the responsibility of the architect, owner, or other design professionals to know and design to local code requirements, the subcontractor or channel glass supplier can serve as a great resource for navigating local codes and providing design support. Suppliers can aid in providing continuing education and resources, as well as narrow the lens on channel glass solutions that balance code, esthetic, and functional goals. For example, manufacturers can apply coatings, polycarbonate laminates, films, and other surface treatments to the material, creating a beautiful glazed system that meets stringent hurricane, sound, and thermal insulating requirements.